As we continue to grow our ITKE family, we are proud to introduce you to our newest addition and the crème de la crème of wellness retreats: Wander Well. You heard that right! 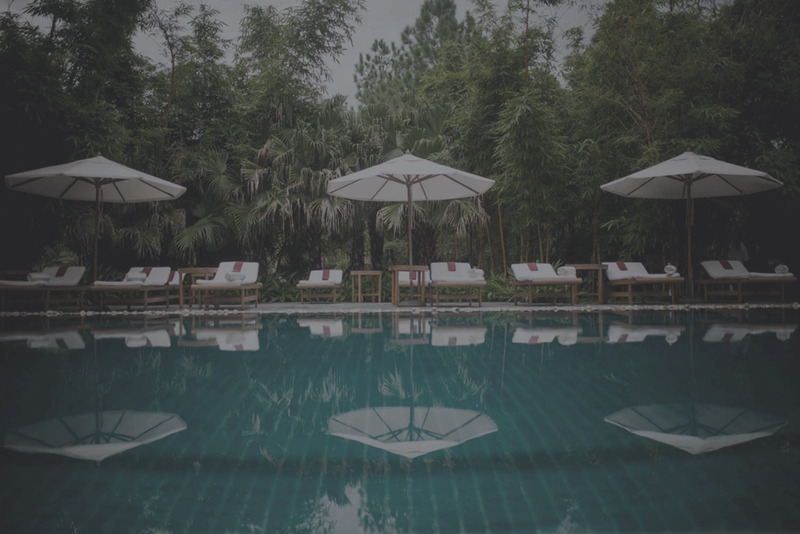 Wander Well is not your average wellness retreat... With a mission to inspire transformation through wellness travel and retreats by curating once-in-a-lifetime experiences in exclusive destinations around the world, Wander Well whole-heartedly delivers on this promise. They live and breathe the mantra that travel is the perfect opportunity to open your eyes and inspire transformation. Each journey is truly intimate & personalized, and each is created with different goals to give you the tools you need for living a mindful life at home and on the road. Read the story & get the details on the upcoming Wander Well retreats below. We met serendipitously during an epic trip to India at world renowned wellness property Ananda in the Himalayas. Our chance meeting was certainly a “wink” from the Universe. We both shared an extreme passion for wellness travel and quickly discovered that together we were destined to design unique transformational wellness experiences, programs and itineraries. WHAT SETS WANDER WELL APART FROM OTHER WELLNESS RETREATS? Wander Well experiences are beyond just a spa and fitness center. Each experience includes self discovery, self care, nutrition, fitness and most importantly cultural involvement. Through the application of our 5-pillar philosophy, we pride ourselves in creating 5+ star transformational travel journeys. WHAT DO YOU FEEL SOMEONE GETS OUT OF A WANDER WELL RETREAT? Wander Well crafts experiences that are relaxing but also thought-provoking and contemplative. Participants will leave feeling rejuvenated but the idea behind each experience is to plant seeds of transformation that can be applied to their everyday life. WHAT WAS YOUR "AHA" MOMENT IN WELLNESS? CAIT FRASER: My "aha" moment in wellness came when I started to design my own retreats. My background has been in curating luxury travel experiences for almost a decade. I realized that I could infuse exclusive offerings with the inspiration of wellness. Once I started to produce these retreats the reactions I got from the participants was PHENOMENAL! I felt as though I had found the sweet spot. To bring people to a place of pure relaxation where the only thing that they need to focus on is themselves and going within. What happens after that is magic. Some call it transformation beyond your wildest dreams. This “aha” moment benefits my guests and allowed me to see my true life purpose. VITINA BLUMENTHAL: I left my career in the music industry and ran away to India to participate in my first yoga teacher training. After the 30-day course, my teacher said to me ‘Vitina, you are so relaxed and calm. I was afraid of you when you first arrived’. Keeping in mind that there was a language barrier, I was still a bit offended. I awkwardly laughed and said, ‘What do you mean you were SCARED of me?’ In that moment, I knew exactly what he meant and realized how much I had shifted from the moment I arrived. I got there being anxious and stressed out. I left feeling relaxed, rejuvenated and inspired. I felt like I could take on the world. It was in that moment I knew that more people needed to go on a retreat to reconnect to themselves again. I wasn't the only one who was dealing with stress in their life. I knew in that moment that I wanted to take people on life-changing experiences around the world. WHAT MAKES A RETREAT IN A DESTINATION SO SPECIAL? The opportunity to learn and grow in a destination that is not at home gives the participant the chance to see their life from outside the box. The regular distractions, habits and chaos of everyday life falls away and they are left with space for themselves. Being able to travel to a new destination naturally provokes transformation. Allowing yourself to get our of your “bubble” at home and open your mind. WHAT SHOULD PEOPLE LOOK TO GET OUT OF A RETREAT? IS IT DIFFERENT FOR EACH ONE? Each person has unique goals when seeking a retreat experience. If you’re unsure what you want from your trip; don’t panic! Sometimes, it’s difficult to understand what compels us to desire certain experiences. Do you want the experience to transform some aspect of your life? Do you want a ‘break from it all’? Do you want to learn new things? Do you want to really get to grips with yoga and meditation? Do you want to become more in-tune with your inner voice? Some current goal-oriented themes Wanderwell focuses on are deepening a mindfulness practice, nutritional education, self-discovery, fitness goals, and stress reduction. WHY DO YOU THINK WELLNESS TRAVEL IS BECOMING SO POPULAR? The reason that wellness travel is so popular is because we all need it. First, people are becoming more educated on health and well-being. They are seeking experiences that are all-inclusive and have a self development component. Second, most of us are digitally dependent, have “to-do” lists that never end, and most of us are guilty of not taking enough time for self-care and personal reflection. By taking the time to travel for wellness you allow the space needed to get back into the present moment, love yourself and go back into your life feeling inspired and rejuvenated. WHAT ARE SOME OF YOUR FAVORITE WELLNESS HOTELS? Ananda means full bliss. Every part of the experience stays true to its name. From the Ayurvedic consultation, spa treatments and personalized menu to the in-house monthly masters (experts) and array of mindfulness and wellness classes. Ananda is beyond magical. It is not just a retreat that will leave you breathless with the enchantment of its surroundings, but assists in redefining lifestyles, from when you arrive carrying it into your daily life. Edmond Szekely and his young wife Deborah, founders of the ranch, were before their time. They opened Rancho La Puerta in June of 1940. Their vision was to integrate ancient verities of health and wisdom into the vital new 20th-century lifestyle. Variety is the spice of life. Beyond their delicious and nutritious cuisine, Rancho La Puerta has an extensive list of activities throughout the day. Embark on a morning hike, listen to the sounds of crystal singing bowls in meditation, flow through a yoga class, maybe get a little creative in the evening and maybe engage in a few new things you’ve never tried. The Ranch is a perfect wellness getaway for solo travellers and also great to experience as a group. Miraval in Arizona offers a unique world class spa, programming that ranges from shamanic healing sound baths, creative programs like art therapy, meditation, grief counseling, bee keeping, a variety of fitness classes, hiking and nourishing cuisine. Miraval gives guests the opportunity to create their own sense of balance to bring back to their everyday life. Something about this place makes you naturally want to slow down. Slow down enough to soak in all its beauty. It’s a perfect combination of enhancing the old with the new. From its original ruins combined with its modern architected villas to the contemporary spa mixed with ancient Mayan therapies and remedies. Beyond just offering a wide range of fitness classes available for everyone to join, Chablé touches on what it means to have a full wellness experience. The staff’s positive energy and smiles really make this place shine. Making you feel like it’s your home away from home. The natural surroundings are what make Chablé special. More specifically, the Cenote that the spa is built around. A Cenote is a body of water that is sacred to the Mayans. There are 10,000 of them in the region. All 10,000 are connected, some only by a small stream of water, underground. It represents the underlying connectedness between all living things, even if it cannot be seen. When you start using words to describe this place, it loses its true essence. You’ll just have to check it out for yourself. It’s a must add to the bucket list. WHAT'S NEXT IN WELLNESS TRAVEL? People are already looking for goal-oriented wellness travel experiences. We believe that most hotels will join this trend and become apart of the wellness travel movement. FAVORITE ESSENTIALS TO PACK FOR A WELLNESS RETREAT? A 4-wheeled roller suitcase, an Incase carry-on with laptop space, MICHI yoga attire, quick-dry Turkish towels that double as a scarf and towel at the beach, flowy dresses from Beachgold Bali, Brixton hats, and polarized Warby Parker sunglasses! Come back to your soul. This retreat will rejuvenate, inspire and lead you to a space of transformation and prosperity. The tools you will learn will set you up for living a mindful life at home and on the road. This Signature Wellness Retreat infuses the natural culture of Chable and the art of mindful living. Participate in a skillful blend of cooperative workshops, alongside the opportunity to indulge in delicious and nutritional Mexican cuisine. During this retreat, you will new routines to nourish your body and mind, learn vital tools to reduce your stress levels, and understand the bene ts of connecting with your soul in times of need. Take the time to slow down, rejuvenate and get reacquainted with YOU in paradise. During this 7-day retreat you will learn and flow through the 7 Chakras. On this journey inwards, you’ll explore what’s blocking you from reaching your full potential. Through meditation, pranayama, asana and workshops, you will dive deep within. You will leave feeling rejuvenated and reconnected to your true essence. Whether this is your first yoga retreat or you’re a retreat veteran, you will take away something on this charming experience. Whether you are new to mindfulness or you are looking to deepen your existing practice, this retreat will set you up with tools to implement mindfulness into your daily life. By diving into workshops that focus on journaling, affirmations, gratitude, pranayama, and nutrition, this is Wander Well’s most emphatically soulful experience. Each body is unique, and the Eat Well retreat will show you how you can succeed on your personal nutritional path toward health and happiness. The fresh ingredients for each meal that we create and share together will be sourced from local farms in the surrounding countryside in beautiful Nicaragua. This retreat o ers nutritional workshops that cover every step along the way to a balanced and healthy nutritional life, taking you literally from farm to table. Living a balanced life isn’t only about what you put in your body, it’s also about how you feel in your skin. We teach you the tools to nd that balance through movement, embracing nature and nourishing yourself. On this playful adventure we invite you to join us at beautiful Nekupe. Our favorite sporting resort will thrill you with a wide range of incredible activities o ered on site. From mountain biking, ATV-ing, a ropes course, yoga, horseback riding and even rum tasting, you will experience the playful side of a wellness retreat. You will leave feeling energized and ready to take on the world after your experience. Eating delicious healthy food, making lasting friendships, and learning to live up to your wildest potential within the rhythms of the vibrant Nicaraguan culture. Come back to your soul. This retreat will rejuvenate, inspire and lead you to a space of transformation and prosperity. The tools you will learn will set you up for living a mindful life at home and on the road. This Signature Wellness Retreat infuses the natural culture of Cable and the art of mindful living. Participate in a skillful blend of cooperative workshops, alongside the opportunity to indulge in delicious and nutritional Mexican cuisine. During this 4-day retreat, you will new routines to nourish your body and mind, learn vital tools to reduce your stress levels, and understand the bene ts of connecting with your soul in times of need.